It’s that time of year again, time to introduce the new Fall/Winter collections. We’re excited about this one, the Santoni shoes collection is killer this season. Pictured above is one of several new style boots, called Cool, which is just that, very cool. It’s got a beautiful soft calfskin make up with super grip sole and contrast laces for some flair. This is the city boot for the winter. 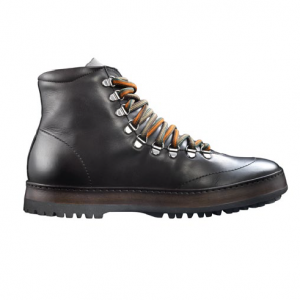 Another noteworthy boot from the collection is the Tibet hand antiqued hiking boots. It’s a high ankle boot made for durability and grip, along with plenty of style. The rest of the new boot lineup is rounded out by the the Quenell, Que, and Shipley, all very unique styles that will have you looking great this winter. Of course a new Santoni collection would not be complete without a wonderful lineup of loafers. The Skip and Jacob suede loafers are particularly attractive this season. The Skip comes in a beautiful blue, while the Jacob is available in a classic Brown. Also the Quint C crocodile embossed loafers are a must see. Available in Black and Brown, it’s a classic loafer with an exotic injection, certainly a shoe that makes your look pop. Very reasonably priced as well. We’ve only touched on a handful of styles here, the entire Santoni Fall/Winter collection is quite impressive and worth a long look. Enjoy and let us know what you think.